I have been making this recipe for 4-5 years now. We really enjoy it every time we make it. Sometimes I make it with all fish, sometimes I use half fish and half shrimp. I love that it comes together relatively quickly and tastes wonderful. As a kid, I loved the chowder in the can. This is so much better. I can't even imagine going back to the can! I don't always serve with a lemon, but it does brighten it up a little. Jaxon prefers his with extra fish... goldfish! He ate a huge bowl of chowder and goldfish last night. He ate two bowls for lunch!! He enjoyed squeezing his lemon in as well. I just love him! I like leaving my fish in relatively large chunks so it doesn't get lost. Plus that way when you are reheating leftover soup and it falls apart a bit, there are still pieces big enough to recognize. I do really like shrimp in this soup as well, but it is not necessary. It is really good with just fish too. In a large sauce pan, heat olive oil. Chop onion and celery finely, cook in olive oil until tender. Chop potatoes into quarter inch cubes. Throw in the pot with the vegetables and cook for about five minutes stirring frequently. Stir in flour and toast for a couple of minutes. Add water/broth and milk, being sure the scrape up the bottom. Add spices and simmer for about 15 minutes or until potatoes are softened. Stir in tilapia and cook for 5 minutes. Add shrimp if using and simmer 4 minutes more. This chowder looks really good. I look forward to making it soon. It is really good. I usually only make it a few times a year, but we always enjoy it when I do! Stopping by from Sunday's Best. This looks delicious. I'm wondering if crab meat would work in the recipe along with shrimp? I'm a seafood junkie. Thanks for sharing. ooooh! That would be delicious. I use crab in my mother-in-law's cajun crab chowder, so the idea would be similar. Yummy! 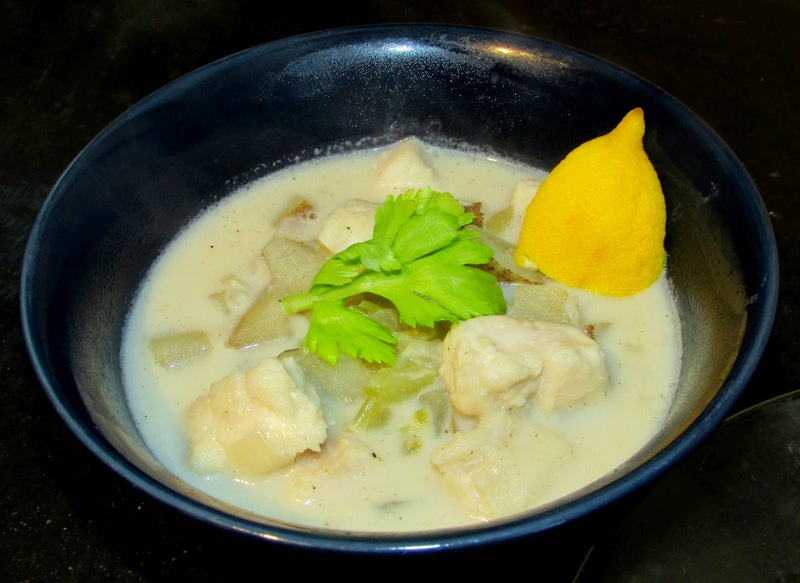 My husband loves seafood chowder, as do I .. definitely pinned to my Food Talk board and saved for future reference! It is so good, Carole! Thanks for stopping by! This is one of my all-time favorite soups. I am glad we are back to soup season!